Our range of products include lycopene syrup, fungal diastase pepsin with b- complex syrup, cyproheptadine hydrochloride trichloline sorbitol syrup, sodium picosulphate oral solution, ferrous ascorbate and banrox - d syrup. 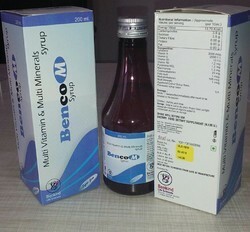 We offering to our clients a wide range of Benco - M that is formulated using pure and quality ingredients. These Syrups are highly effective and are used across various medical industries for the treatment of various ailments. We are a remarkable entity, engaged in offering superior quality range of Benzyme Syrup. The offered syrups are formulated using finest quality chemical compounds and the latest technology by our vendors. Benzyme Syrup contains Fungal Diastase and Papain as active ingredients. Benzyme Syrup works by helping in the breakdown of proteins; improving nutrition absorption and utilization. We offering to our clients a wide range of "Trichloben'' that is formulated using pure and quality ingredients. These Syrups are highly effective and are used across various medical industries for the treatment of various ailments. 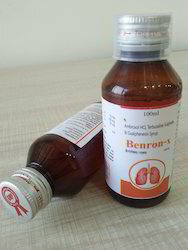 We are extremely engaged in offering a comprehensive assortment of Benron - XT. This syrup is processed in accordance with the industry standards by our consistent vendors using best quality chemical compounds. Owing to its varied features like best quality and correct chemical composition, the entire array is highly demanded by our clients. As per the variegated requirements of our clients, we are offering a broad collection of Banrox - D. The entire range is accurately formulated under the supervision of vendor’s pharmaceutical experts using high-grade chemicals and sophisticated technology. In addition to this, the offered range is stringently tested on various quality parameters to ensure its safe consumers. 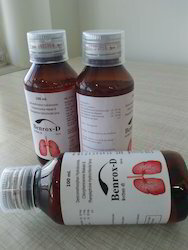 We offer our clients an optimum quality Benron - X which is precisely processed using supreme grade chemicals and ultra-modern techniques in sync with set medical industry standards and norms at our production unit. Owing to its effectiveness, this syrup is highly demanded among our patrons. 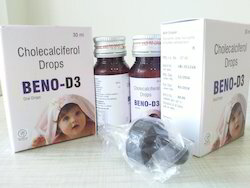 We are engaged in offering a range of tested and extensively researched based Beno - D3 to our clients. We supply various pharmaceuticals to well-known organizations and export houses in the country as per their requirements. Cholecalciferol is used to treat or prevent many conditions caused by a lack of vitamin D, especially conditions of the skin or bones.